The Washington Kastles became the first team in major U.S. pro sports history to complete two consecutive perfect seasons by defeating the Sacramento Capitals 20-19 in the dramatic, back-and-forth WTT Finals in Charleston. No team in 35 years of World TeamTennis had ever completed a perfect season until the Kastles improbably went 16-0 in 2011. And no one, not even those on the Washington roster, could have ever imagined that the second perfect season would come the very next year, from the very same team. Before making history, the 2012 Kastles found themselves tied with their opponents entering the final set for the second straight night. Then, just as she did in the Eastern Conference Championship match on Saturday, Venus Williams won women's singles to clinch the Kastles' victory. Venus has been struggling with Sjogren’s syndrome, an autoimmune disease that causes fatigue, for about a year. Washington has now won seven matches by one game during its historic 32-match winning streak, which is one victory shy of the longest winning streak in major U.S. pro sports history. The Los Angeles Lakers won 33 consecutive games during the 1971-72 NBA season. The Kastles overcame a spirited effort from a Capitals squad that took an early lead when World No. 35 Kevin Anderson defeated reigning WTT Male MVP Bobby Reynolds 5-3 in men's singles. Williams and Anastasia Rodionova rebounded with a 5-1 win in women's doubles, but the Kastles' lead disappeared as Anderson and Mark Knowles upset Reynolds and World No. 5 doubles player Leander Paes 5-2 in men's doubles. Down by a game going into the fourth set, Paes and Williams won mixed doubles 5-4 to tie the match at 15-15. That left Williams and World No. 87 CoCo Vandeweghe of the Capitals to battle in a winner-take-all women's singles set. Vandeweghe took the upper hand early, breaking Williams to claim a 3-2 lead. But Williams broke right back for 3-3. After service holds by both players to even the set at 4-4, the match, the season, the championship and the Kastles' unbeaten run would all come down to a tiebreaker up to 5 points. Williams faced an immediate 0-2 deficit after losing the first two points on her serve. But when Vandeweghe barely missed on a backhand down the line on the third point, Williams began a run of five consecutive points to win the tiebreaker 5-2 and cement history for the Kastles. 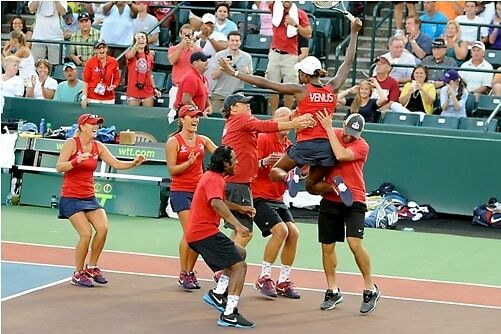 As Vandeweghe's final forehand flew long, Williams' teammates stormed the court to celebrate with the four-time Olympic gold medalist -- Paes and Reynolds lifting the 6-foot-1 Williams on their shoulders as hundreds of Kastles fans who made the trip to Charleston cheered from the stands. Sensational as the Kastles' perfect season was in 2011, their encore in 2012 was even more surreal. Washington won five of its 16 matches this season after entering the final set either tied or trailing. In the most dramatic finish of the summer, Williams overcame a six-game deficit on the road against New York on July 21st, saving four match points to spark the largest comeback in franchise history. The Kastles remained perfect in the absence of Paes, Rodionova and Williams for the final four matches of the regular season, when all three players were preparing for the London Olympics. 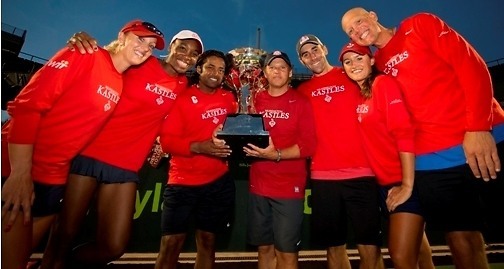 The leadership of Reynolds and Coach Murphy Jensen helped substitutes Treat Huey and Edina Gallovits-Hall and wild card Raquel Kops-Jones fit right in with the Kastles culture. Then came WTT Finals Weekend, during which the Kastles encountered fifth-set deficits of 15-14 against the Sportimes and 18-17 against the Capitals. Neither lead lasted for the underdogs as Williams rallied behind the support of her teammates on the bench and her legions of red-shirted supporters in the stands. The Kastles have now captured WTT championships in 2009, 2011 and 2012. They will return to Kastles Stadium at The Wharf on DC's Southwest Waterfront in the summer of 2013, with the Lakers' long-standing record in their sights.